Stylish Pakistani Bridal Dresses: Pakistani culture is immensely rich when it comes to fashion, especially that on weddings. With a number of events, Pakistani weddings are typically a week-long and are nothing short of festive. Finding a stylish and gorgeous bridal outfit becomes a nightmare! With a plethora of Bridal Designers available, how can you pick one? A wedding day is the most important day of any girl. Outfit trends bring you a list of 10 Stylish Pakistani Bridal Dresses collection for this season. So, on one of the most important days of a bride’s life, she should look pretty and elegant. Every other girl wants to look at a fantastic bride on her wedding day wearing a beautiful bridal outfit. A Pakistani bride desires to wear a beautiful bridal Gown. Every bride wishes to look beautiful on her big day since that’s the most important day of her life. It’s important to make sure that a bride selects the best outfit for herself. Beautiful bridal couture can turn the dream wedding and the dress into a reality. Selecting what you want to wear on your wedding day can be made easier by taking various aspects of your special day into consideration. What Pakistani Bridal Outfit To Wear This Season? Accessories are an important part of your wedding day as they complete the look. Too many accessories can look over and can ruin the complete look. Keep your accessories very simple and choose no more than two jewelry accessories. For example, if you are wearing a necklace, only wear one bracelet. Match your outfit with a stylish wedding headband if you want to try something different. Shoes are also essential. The bride needs to choose the best shoes that compliment the look. Bridal dress is one of the most important elements to enhance your looks. Especially when we shift our focus on girls they are more concerned about the dressing and trend selective. When buying bridal dresses one needs to make a budget. The less the price the better it will be. Customers try finding the best spot where they can get good quality fabric or a dress at a cheaper rate. 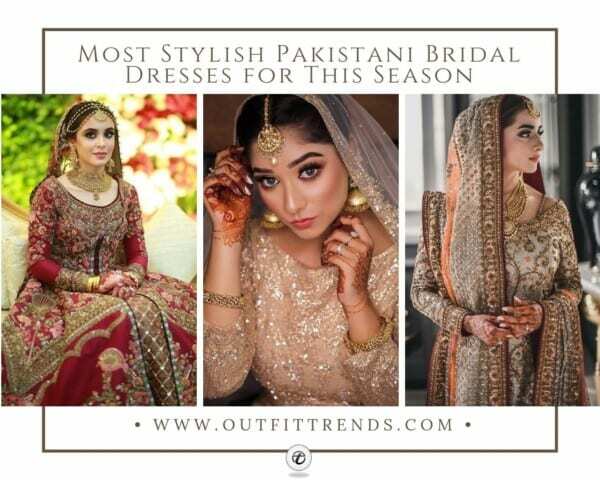 Tariq Road, Jama Cloth, Kehkashan market, Rabi center are famous areas of Karachi where customers can easily purchase the trending bridal outfits. In current time Pakistani fashion designers do pay attention to Pakistani bridal dresses. There are plenty of designers in Pakistan. They have their boutiques in the main cities of Pakistan. Some of the famous designers of Pakistan are Deepak Perwani, Maria B, Rizwan Beyg, Nomi Ansari, Sana Safinaz, Nickie Nina etc. Every year Bridal Couture week is held, in which most renowned designers bring their new collection of wedding dresses for women and men both. So if you can looking for some top Pakistani wedding designers then Pakistan bridal couture week Dresses are the best choice to look for. Be it an engagement, a wedding, a Valima or any important occasion designers bring new trends and styles in the market. One can always check their catalogs online and samples are also available at their stores. Latest trends, designs and best fabric material are also available. Messy hairstyles, buns and rose hairstyles are currently the best hairstyles for brides. Typically, Pakistani brides cover their head with the veil. Despite that, a bride sure needs to keep her hair in check. With over a dozen Hair Bun styles available, choosing one that suits you shouldn’t be a problem! The hairstyle is mainly chosen to suit one’s face shape, as well as, jewelry. Women wearing a Teeka, usually opt for a middle partition, but can also go for a side parting. Similarly, brides wearing a Matha Patti tend to get a mid partition to secure it firmly. The puff, along with backcombing, adds some height to the front. While the twisted and pinned curls of the bun add volume to the hair. Here is another subtle and delicate look for brides. The hair has been secured behind in a bun, leaving a few strands around the face. This helps make the frame of the face look slimmer. The Teeka has been worn with side-parted hair and we love the look. The hairstyle also perfectly complements the jewelry and the boatneck of the dress. You can also let your hair down by simply blow-drying or curling them for a different look. When it comes to bridal accessories and jewelry, Pakistani actress Ainy Jaffri’s wedding looks are our favorite. The big peacock themed Matha Patti that she chose for the mehndi function is especially mindblowing. She varied her look each day, looking breathtaking on all her events. She went for heavier jewels for her Baraat occasion choosing a layered necklace to go with her choker. As her hair accessories, she chose some flowers for her Nikkah and a Jhoomar for the Baraat. Here is a bride that broke the Internet with her absolutely stunning wedding look. Ryan Hikmat chose a custom made Fahad Hussayn bridal outfit that she styled with some delicate gold jewels. The stunning headgear and the necklace look perfect with her embroidered wedding outfit. We have a special place in our hearts for her gold bangles. 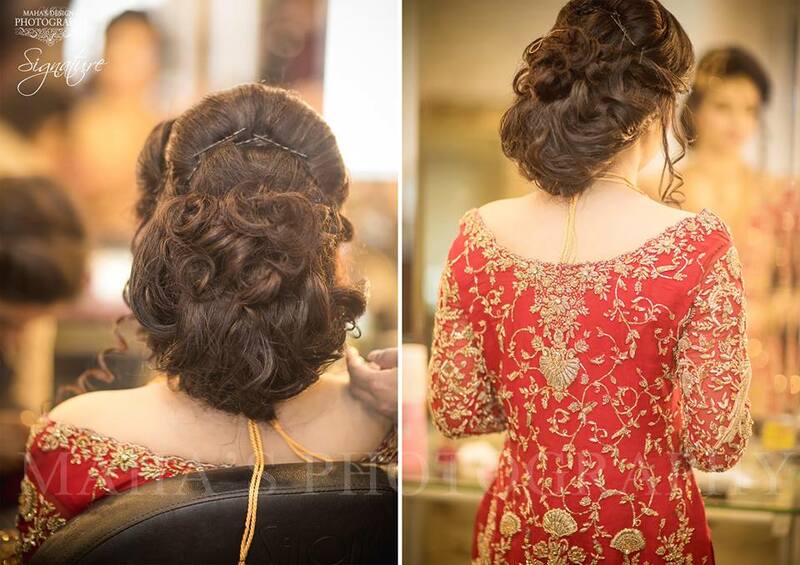 Her bridal look has received immense love from all over and we can see why not! Maayoun marks the beginning of the Wedding festivities in Pakistan. Brides are dressed in yellow ensembles and are applied a Yellow Paste of Ubtan. The occasion is marked with a celebration of music, dance, and laughter. Like every other event, the bride ought to look her best on this occasion. Here is an outfit we totally admire. Ghararas, wide-leg trousers in the East, are the perfect choice for this day. We love how perfect this embroidered yellow shirt looks with it. These outfits are typically styled with Marigold accessories to keep up with the theme. Here is a more festive and modern look. This is another way to dress up on your Maayoun occasion. The pink and blue detailing adds in a nice pop of color, brightening up the look. The accessories have been kept minimal, only featuring some colorful bangles matching the theme of the outfit. Mehndi is one of the most festive events of all. It is an occasion filled with dance and music, where henna is applied to the Brides. The best colors for this event are the brightest ones such as orange, pink or green. You can choose to go simplistic with some flower accessories and a soft glam up. Or, you can have a fancy approach with heavy jewels and some bright makeup. Have a look here at 15 Stylish Pakistani Mehndi Dresses Collection this Season. Undoubtedly, most girls love the color black and feel that they look their best in it. However, Pakistani culture does not allow many brides to choose it as a wedding dress color. So what you can do instead is, pair black with another color of your choice such as red or gold. Here’s Iman Aly looking her absolute best in a black and blue combination. Black can also be worn by wedding guests. With velvet shawls making the rounds, we totally love this idea of rocking it over a plain velvet shirt. The embroidery gives it a beautiful look, making it a must-have piece. Shawls can be styled in a number of ways with a number of outfits. If you are a bride-to-be, you could add in a similar shawl to wear with your Bridal Outfit. If you are planning on color coordinating with your better half, what better than to go for a classic combination of black and gold. The color is definitely a great choice for how nicely it can be styled. For your Baraat, go for a Black and gold thread worked outfit for a unique wedding look. Check out this stunning bridal outfit with intricate embroidery and a gorgeous color combination. The plum color is standing out beautifully against the dull black while the golden embroidery is enhancing the look of it. This outfit makes for a great Bridal dress for Baraat and Nikkah functions. This designer outfit gives us some inspiration on how to wear black without it overpowering the entire look. Go for a dull black shirt with some glittery gold embroidery. Keep your Dupatta and the Lehenga a shade of red to keep it from looking boring and dull. Red and Blue is another trendy color combination. Allow one color to stand out or mix and match with some patchwork and embroidery detailing. Here’s a combination of red with two shades of blue, making it a fresh and appealing piece. The outfit has a classic, Mughal touch to it with the neck style. Since red is the commonly worn color for Brides in Pakistan, it does get monotonous and boring. However, adding in different colors with the classic red makes it a unique and elegant look. If you don’t want to overdo blue, you could keep it minimal with subtle hints of it. In doing so, you will be able to allow the red to stand out and have its own beautiful touch. If you are afraid of tripping over in a lehenga and want something different, this gown seems like a great pick. Another great thing we love about it is the patchwork on the sleeves, making it minimalistic yet stylish. The most trending color for daytime Nikkah functions right now is either white or off-white. To make their dress stand out, brides usually pair white with another color of their choice such as blue, red, pink or green. Neutral and light tones are also an excellent choice for outdoor wedding shoots. Since a lot of brides look for color and don’t want to settle for white, we have an option for you as well. This golden gown with a mint green dupatta is another great subtle combination. You can pair the outfit with some shimmery gold accessories giving it an Eastern touch. This is another long gown outfit idea for brides wanting a different look on their big day. However, if you are in need of some color while going for a simplistic look, this is a great option. This purple ombre gown with gold embroidery is a great outfit you could wear on your Nikkah. The Dupatta can be in a similar purple color or a contrasting tone for a different and unique wedding day look. Hot pink is one of the most trending colors of the year and it is a color which looks great on all girls, no matter what skin color or body type they are. So if you haven’t yet decided a color for your big day, do give this hot color some thought. It can be worn on the Baraat event, as well as, Mehndi. For the Mehndi, it can be styled with some other bright colors like Green and Orange to keep up with the theme. Here is another outfit option in the same color and style. We can tell by now how lovely Hot Pink is and the number of ways in which it can be styled. You can contrast it with either Gold or Silver and match your accessories accordingly. Peach, Gold, and shades of white are the perfect choice for a Valima. These subtle tones give a soft bridal look. You can choose among different pastel tones as well for a simplistic and pretty look. One reason for this is that such colors look great on brides but also because it gives them a different look from the dark colors that are usually worn on Barat or Mehndi. The Valima makeup to go for with such outfits is also a very light and fresh one, giving the bride a radiant glow. Here’s Fatima Khawar looking ethereal in a Peach bridal outfit. Her loose curls are also a different take on the usual bridal hair-do that we simply love here. How beautiful this combination of Gold and Pink? We love how the bride has kept her makeup and jewelry really soft. One tip for all brides is to keep their necklace simplistic on the Reception day. If the neck is heavily embroidered, adding in a heavy necklace makes the two look like a misfit. These pictures are proof enough of how Pink and Peach is the ideal choice for Valima events. Another thing to add is that long shirts and gowns seem to be trending the most. If you are going for a Lehnga on the other events, it is best to sport something different on the last day of your wedding celebrations to look unique and radiant. Really amazing and nice looking dresses. Also latest to the fashion. The content is also awesome. Keep it up. A ravishing range of new arrivals by Insam is now live. The inimitable designs are a statement of style, aesthetic and prowess. An all-inclusive range of masterpieces in Luxury Pret and Formal wear available online and in stores.